Low margins, enormous overhead, perishable inventory, cutthroat competition and crabby customers are just a few reasons the grocery business isn’t easy. But that’s not deterring Amazon’s most recent example of relentless expansion in its hometown of Seattle. Rumored to be a subsidiary of its Project Como dedicated to cracking the American grocery store nut, Amazon Go offers customers the breezy convenience of shopping without the hassle of lines or cashiers. Scan your phone when you walk in, grab whatever primary perishable items you like and walk out the door. Forget the dry bulk goods, they can be delivered right to your home. Rather than the traditional model of using cashiers and scanners to total up a basket of goods, Amazon’s Go stores rely on cameras, an app and augmented reality technology to keep an accurate running total. While the company declined a formal interview, Amazon pushed back against The Wall Street Journal’s story. Grocery analyst David Livingston of DJL Research, said the most significant innovation with Amazon Go is not needing cashiers, which he said—in conjunction with smaller footprints—could significantly improve the historically slim grocery industry profit margins. He predicted Amazon’s expansion will work its way down the West Coast, with future stores possibly landing in Portland, San Francisco and Los Angeles. Bill Bishop of Chicago-based Brick Meets Click struck a different note, saying Amazon’s in-store technology will prove to be the most significant advancement for the grocery industry. He added that the company’s deep pockets and long-term interest in the category will likely lead to aggressive pricing to attract grocery customers. Even if it succeeds in reaching 5 percent of the American grocery market, he said, Amazon can still have significantly negative impacts on larger grocery brands, many of which have a store network that’s based on 20- to 30-year leases, making it more difficult to right-size stores to shrink overhead costs. 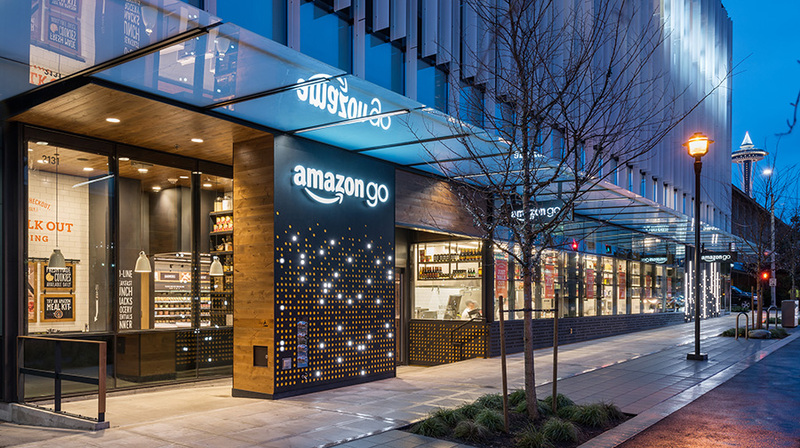 Regarding Amazon’s denial of plans to eventually build 2,000 grocery locations, as has been widely reported, Bishop said that’s not so far fetched if Amazon Go turns out to be a success during initial trials.